For centuries oils have been revered for their ability to help nourish, moisturise, repair and smooth hair. Today, oils are a hot beauty trend as women once again realise and appreciate their power. However, some traditional oil infused products can leave hair limp and greasy and many salon treatments are expensive and hard to find. Dove Hair will exploit the benefits of oils and make their powerful properties available to women everywhere, through the launch of their weightless nutri-oil technology. After a decade of research and development, Dove is expecting its new Nutritive Therapy Nourishing Oil Care Range to transform the way women feel about their hair, with the hero product - Nourishing Oil Care: Nutri Oil Serum anticipated to achieve cult status once it hits supermarket shelves. The new wonder serum reduces roughness and frizz by 99% and is scientifically proven to leave your hair as smooth and shiny as the latest 'wow' product Moroccan Oil Treatment, yet is just a fraction of the price. Dove's weightless nutri-oils are formulated with natural oils known for their short chain molecular structure, allowing them to move over the hair easily and penetrate deep into the hair shaft, providing nourishment from root to tip. Nutri-oil technology helps to replenish lipids lost from the hair with those found in natural oils. Lipids are vital to hair health as they act like cement to hold protein within hair shaft keeping it healthy and supple. In Australia 23% of women suffer from dry or damaged hair*, most often caused by aggressive climatic factors, chemicals and the daily styling torture of blow-drying and straightening. Formulated with both Coconut and Sweet Almond Oil, Dove Nutritive Therapy Nourishing Oil Care: Nutri Oil Serum has been tested to reduce 99% of roughness and frizz, turning a dry and unmanageable mane into soft and silky, finger-runnable hair. Absorbing from the moment it is applied, the hair shaft is deeply nourished with no greasy residue. "We were surprised to learn that Indian women apply rich oils to their hair and leave them overnight, allowing hair to absorb all the benefits of the oil. The result is shiny, more manageable locks, yet hair was prone to greasiness. Following years of scientific work we have successfully developed a product that delivers all the conditioning efficacy of oil, yet in a light formulation that doesn't leave a trace of grease on the hair." "We selected Coconut Oil and Sweet Almond Oil as the base for the Nutritive Therapy Nourishing Oil Care Range. Coconut Oil is high in protein yet has a low molecular weight, allowing it to penetrate the hair shaft and protect it from damage, while Sweet Almond Oil is a vital component of the hair cortex and is known to strengthen the hair fibre" concluded Katya. Also launching is a new Dove Nutritive Therapy Nourishing Oil Care Shampoo and Conditioner.The secret to the range is its super-conditioning oil base that is rapidly absorbed to deeply nourish and protect the hair shaft. When used as a three-step system, roughness is smoothed and hair becomes more manageable, allowing women to make friends with their hair. "At Dove, we believe its essential to create and market products that are efficient and affordable. We spotted the oil trend within the hair category, and saw that the current market leader was not accessible in supermarkets, and therefore not available to many Australian women. We wanted to develop a product that gave women all the benefits of oils without weighing their hair down with a greasy residue. We're delighted to launch this new product and help Australian women smooth 99% of their dry, rough unpredictable hair with a product proven to perform at parity with the leading salon treatment". 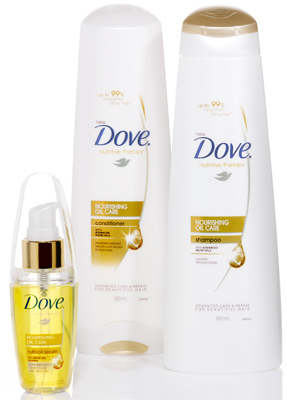 The new Dove Nutritive Therapy Nourishing Oil Care Range is available in supermarkets.